Hello! Steven from Seika here. This article will be about the 5th International Understanding Festival, sponsored jointly by the Town of Seika and Seika Global Network. 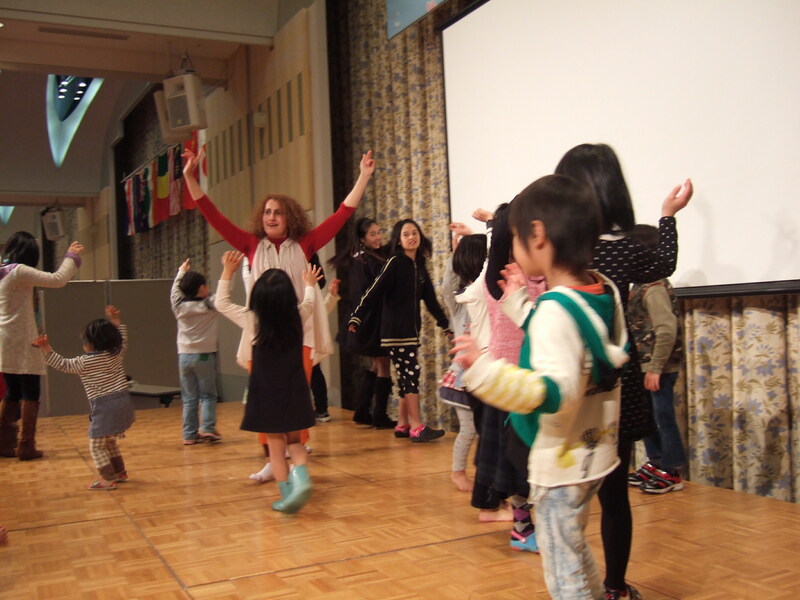 The Festival was held on Sunday, April 21st in Seika Hall at the Seika Town Office. 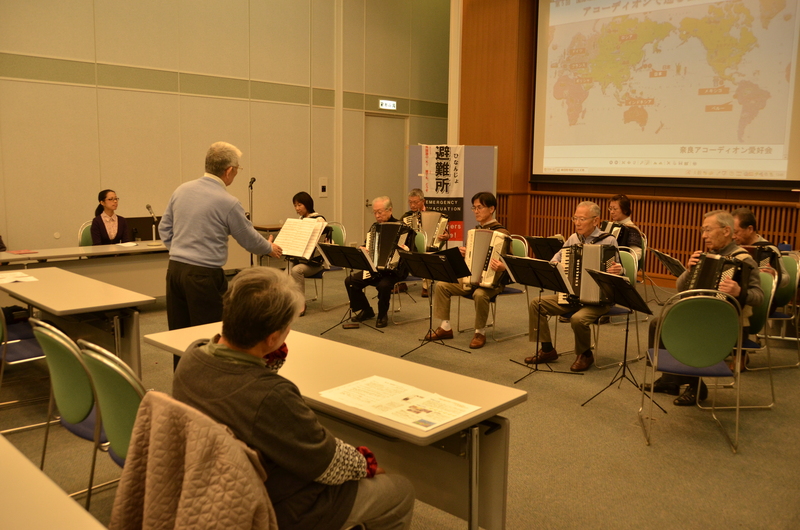 The event began with a performance by the Nara Accordion Club. Staying true to the theme of the event, the club played a variety of different songs from France, Germany, Greece, Indonesia, Mexico, Peru, Russia, and of course, Japan. The only songs I recognized were the Mexican Hat Dance, which is fairly well-known back home in America, and the opening theme song from My Neighbor Totoro, which I hear a lot in Japan. It was great getting to hear new songs from all over the world. Following the accordion performance, Tsubasa Nakayama, a student at Ritsumeikan University, gave a presentation about his time abroad at the University of Washington in Seattle, Washington, United States of America. He talked about the famous aspects of Seattle, such as the frequent rain and heavy concentration of coffee shops, as well as his homestay. It sounded as if he had a good time. 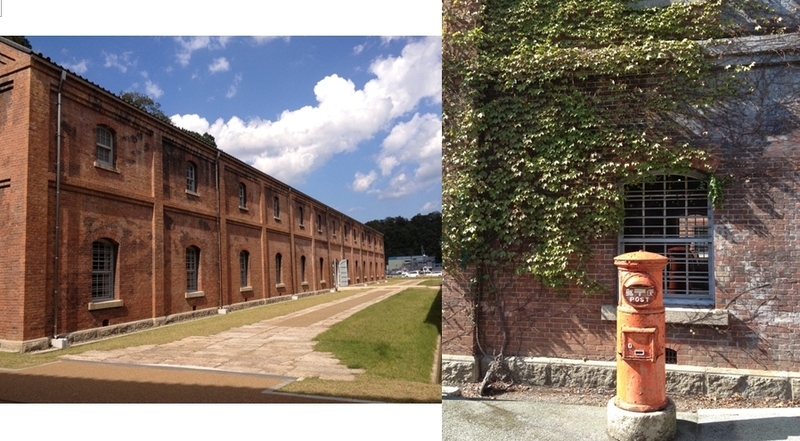 Next was a presentation about one of Seika’s public schools, Kawanishi Elementary School. 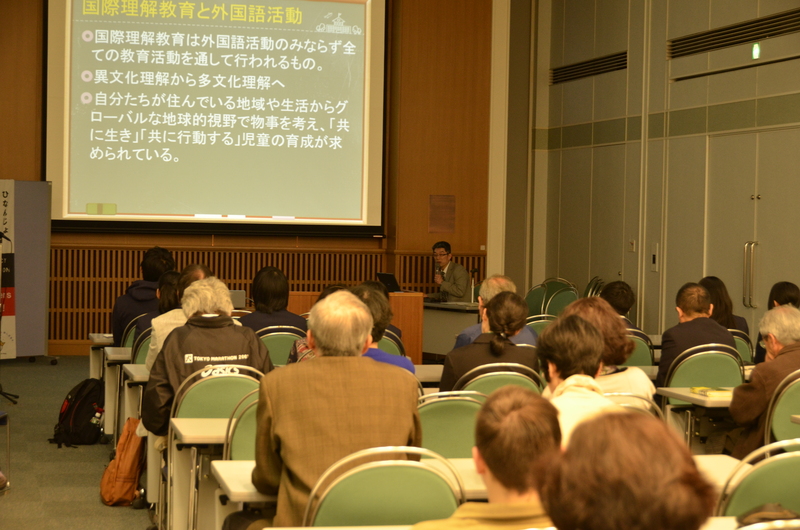 Hideki Ikubo, the vice principal, talked about international education activities at the school. Kawanishi students in the 5th and 6th grades study English in school, with 35 hours of class in an academic year. Also, Kawanishi students in all grades have special international education classes that do not necessarily include English language instruction but rather an introduction to American culture and games. After Mr. Ikubo’s presentation, the students of Seika Minami Junior High School’s English and International Exchange Club recited various poems and stories entirely in English. Despite only being in middle school, their presentations boasted high-level words and impressive fluency. 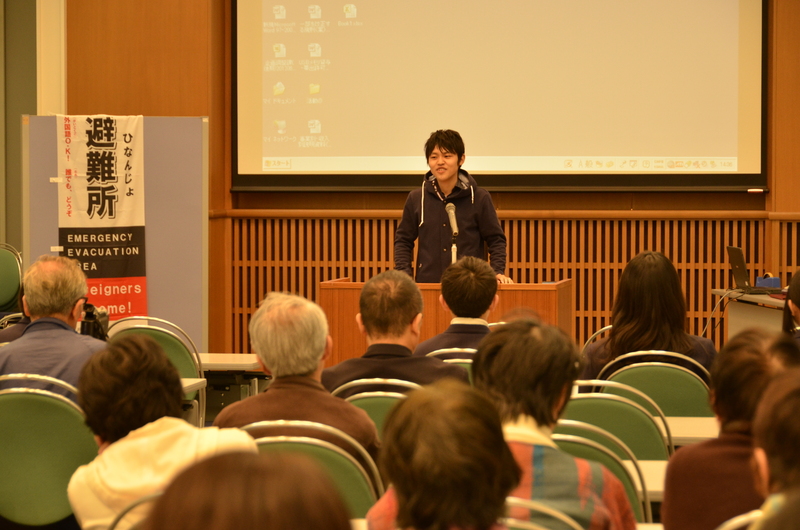 The final part of the event involved a description of Seika Global Network’s activities. 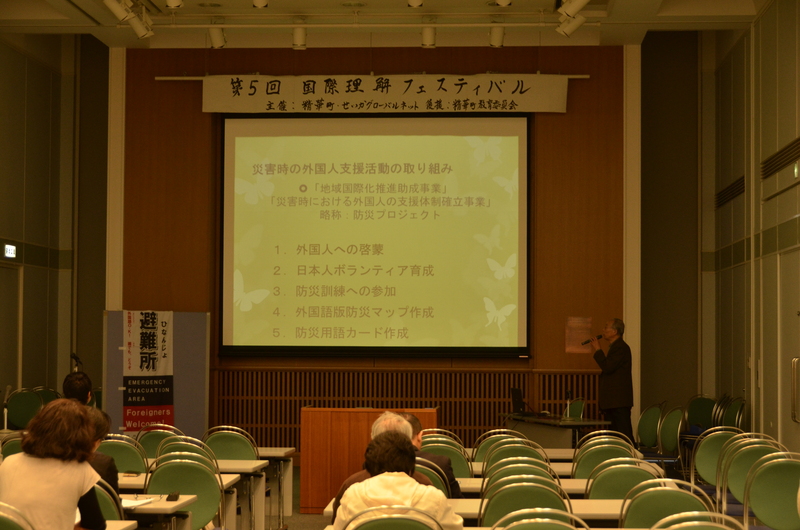 Nobuo Kawabata, the vice chairman of Seika Global Network, used a Powerpoint slideshow to describe Seika Global Network’s assistance for international residents regarding disaster awareness and preparation. 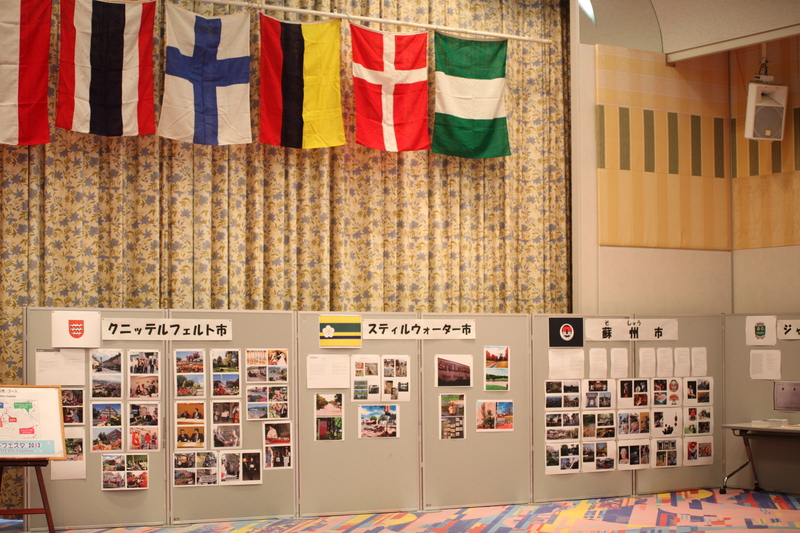 For instance, Seika Global Network set up an International Resident Support Center at last year’s disaster preparedness training in Seika and recently published disaster awareness maps in English, Chinese, Korean, and Vietnamese. 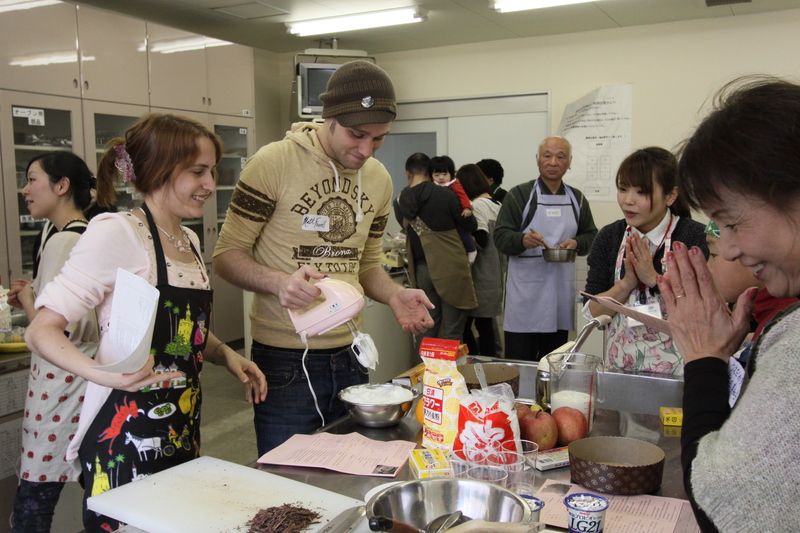 Other Seika Global Network activities presented at the event included a Japanese class for international residents, an English conversation class, a separate English class with a theme of Japanese culture, an agriculture group, a sister city exchange group, and a web design group. Next year will be the 6th International Understanding Festival. Hope to see you all there! Hi! Alice here, the CIR at the Kyoto Prefectural International Center. I would like to inform you about our next seminar, “Multicultural Society in France and England”. France and England are well known for being multicultural countries. But what is the current state of immigration, how do immigrants actually fare in society? What are the pros and cons of immigration? What are the current problems and general opinion about it? In this seminar, we will discuss about these topics and how a multicultural society could be achieved. 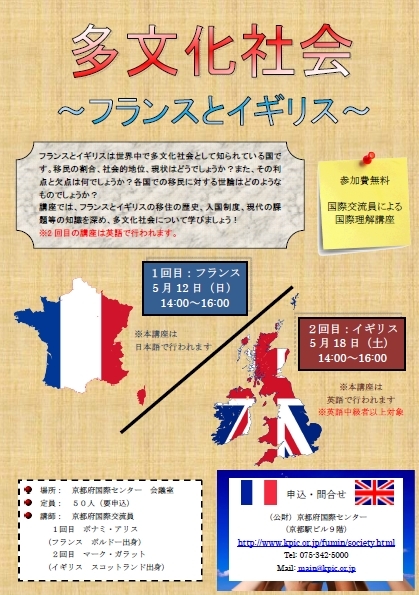 The 1st seminar about France will be in Japanese, the 2nd seminar about England will be in English. 1st seminar: Multicultural France May 12th (Sun), 14:00-16:00. 2nd seminar: Multicultural England May 18th (Sat), 14:00-16:00. We hope to see you during the seminars! Hi! This is Alice from KPIC. The cherry blossoms have ended and spring is finally here! 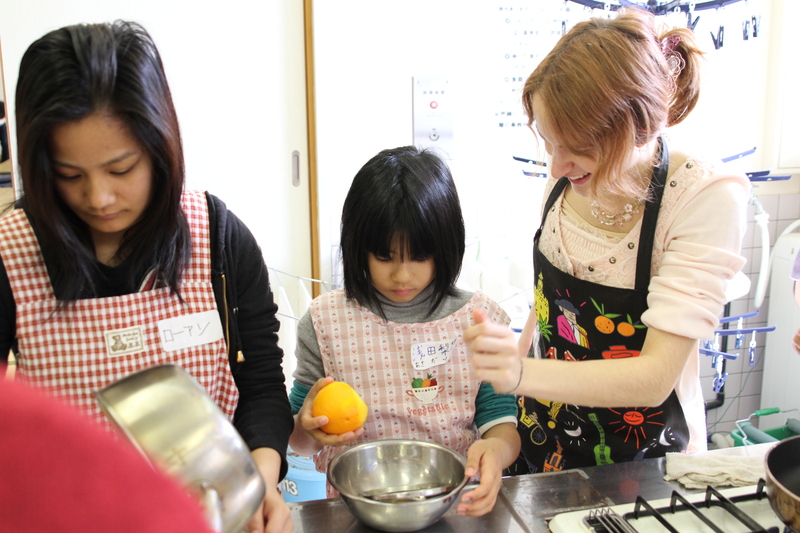 On March 16th, I did a French cooking class in Kyotango City. 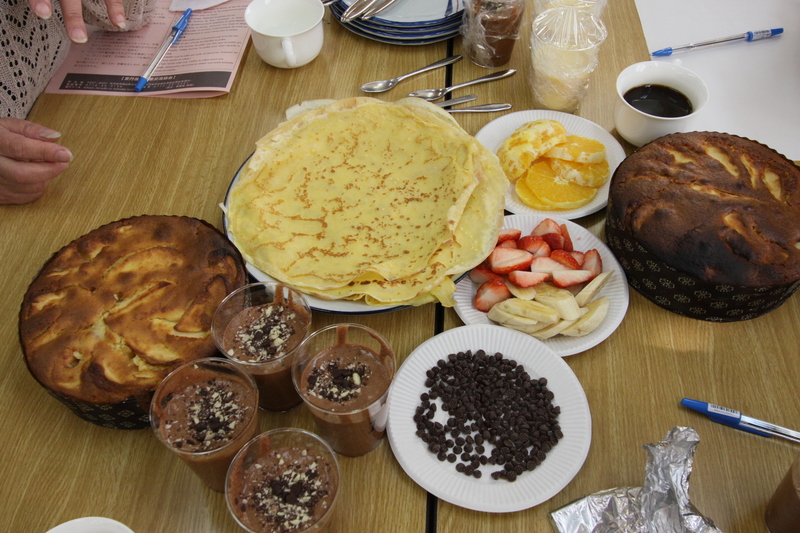 This time, it was a dessert cooking class in the afternoon where we cooked 3 sweets: chocolate mousse, yoghurt cake and crepes. We first started with the mousse as it needs to be refrigerated 3 hours or more before actually turning into a mousse. 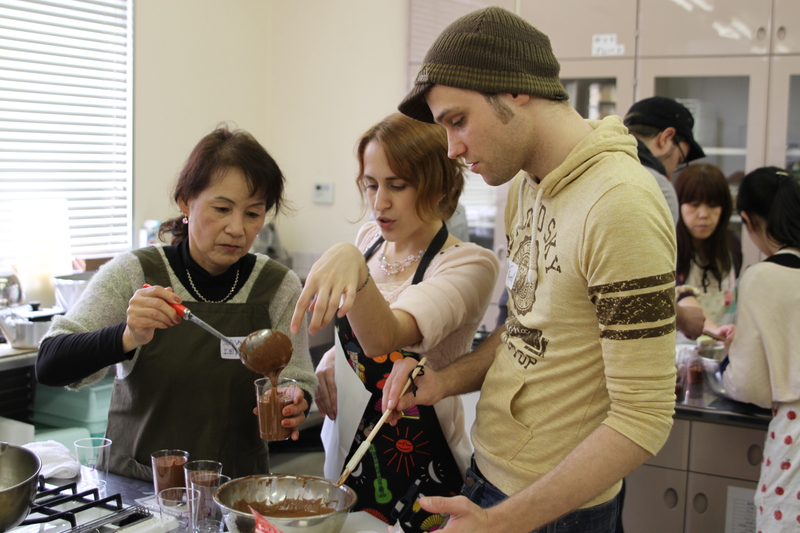 The sweet smell of chocolate started to float around the room as participants melted the chocolate and got started. The hardest part when doing a mousse is to get the right consistency. To do so, you have to beat the egg whites until they get thicker and they shouldn’t fall even if you turn the bowl over. It was funny to watch everybody do so and be excited when the whites stayed at the bottom! 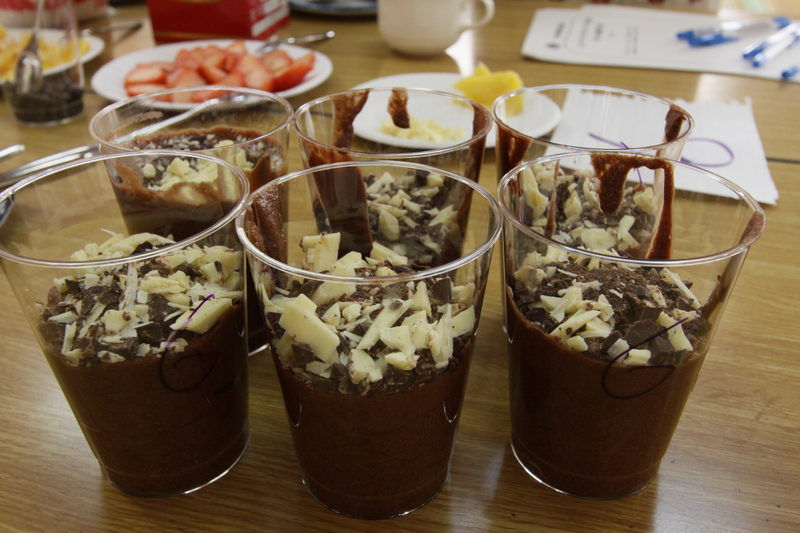 Once the mousse was ready, we put it into cups and in the refrigerator. 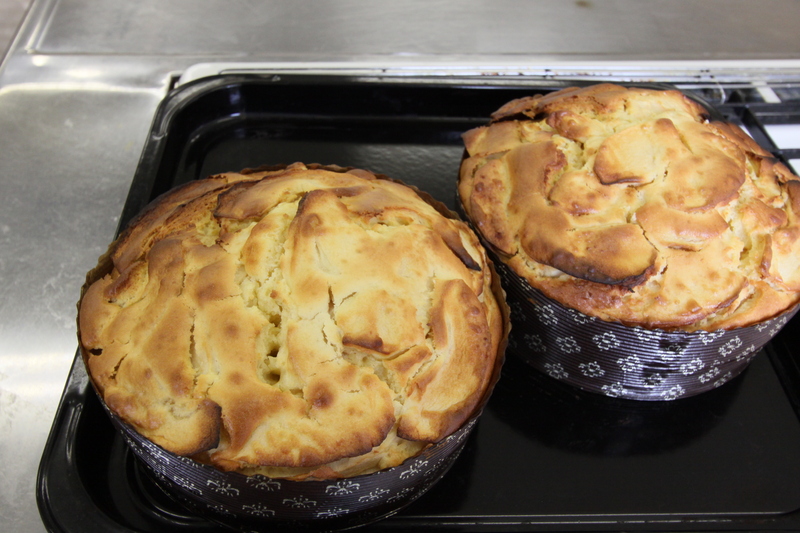 The yoghurt cake is a really popular and easy to do French cake. Basically, you use one yoghurt’s carton to measure all the other ingredients, put everything together, mix, add the flavor or fruits you like and bake. In France, even 3 year old children can bake this cake, so it’s really popular for picnics, parties and rainy Sundays. For the crepes, I always use my grandmother’s recipe which is… to put orange peel into the batter! It’s always a success even if it’s quite bothersome to grate a whole orange. To make good crepes you have to make sure that everything is well blended without lumps, add a few drops of vanilla essence and sugar until you cannot feel the taste of flour anymore and the batter itself tastes sweet. Use only one ladleful of batter in a heated fry pan, spread it using round movements, cook until both sides are colored and you have a wonderful French crepe! As in Japan, we put fruits, whipped cream, jam, honey, chocolate inside the crepes but the most common way of eating them is with either sugar or Nutella. It was quite tight to make 3 desserts in 2h30 but we managed to finish everything on time and eat all together, although the mousse was better after leaving it a whole night in the fridge! 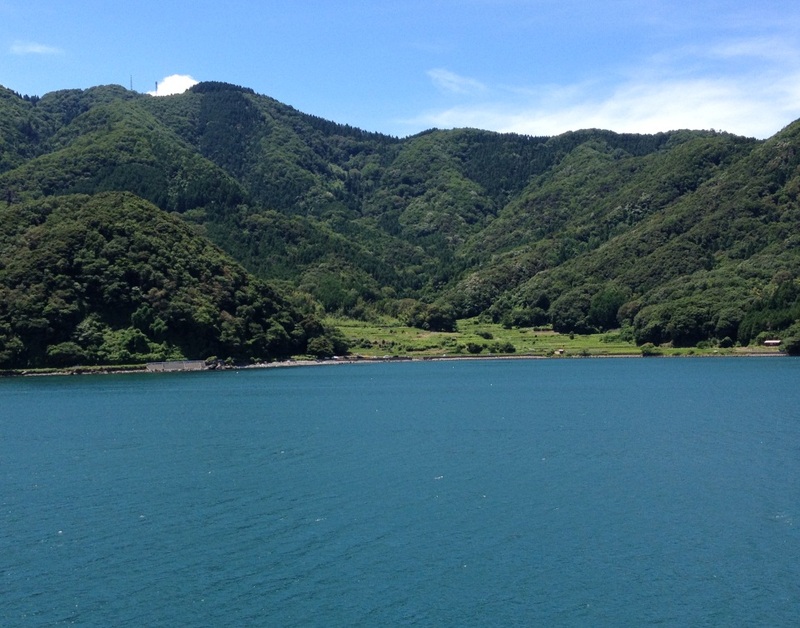 I really like Kyotango with its pretty beach, delicious food, onsens and warm people! Especially their accent! I hope I will have other occasions in the future to take the Kyotango people to France for a few hours! Chocolate mousse, crepes and yoghurt cake. Let me know if you want the recipes! Hi! This is Sun Li Di, the CIR in Maizuru. As the saying goes, “time flies like an arrow”. One year has already passed, the cherry blossoms came back to Maizuru and time to go home is getting closer. 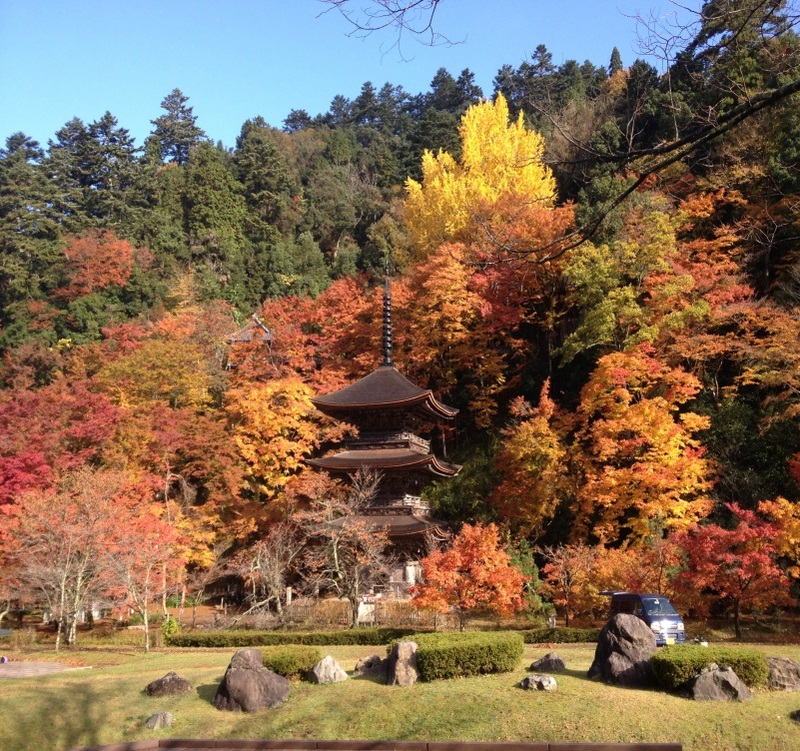 The dazzling sunrise from Mount Gorogatake, temples and shrines full of Japanese culture and history, Maizuru’s modern red brick warehouses or the gorgeous maple trees in autumn at the Kongo-in temple, all these fresh experiences I made when I arrived are now engraved as nostalgic memories into my heart. Even the hot summer that was so hard to bear is now part of these memories. Before going back, I am very grateful to my coworkers for accepting me and helping me at work, the first time I experienced a Japanese office, the Maizuru citizens for welcoming me as family, my teachers for letting me experience Japanese culture and all those people that supported me. Thank you so much. I am going back to Dalian with the memories I made in Maizuru for one year, and I hope I can contribute to the friendship and cooperation between our two cities. 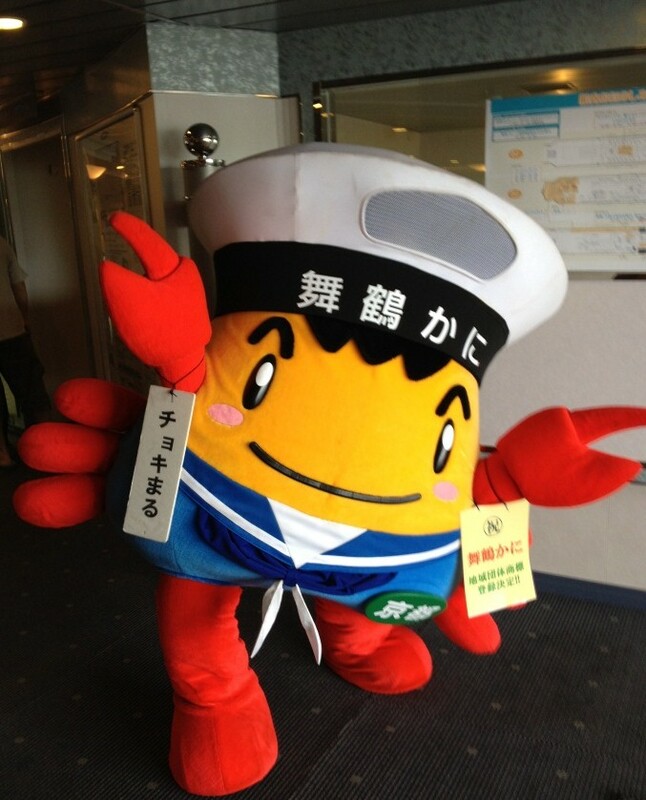 I hope to come back to Maizuru one day and meet everybody again! Hello everyone! This is Margaret, CIR from Kameoka. 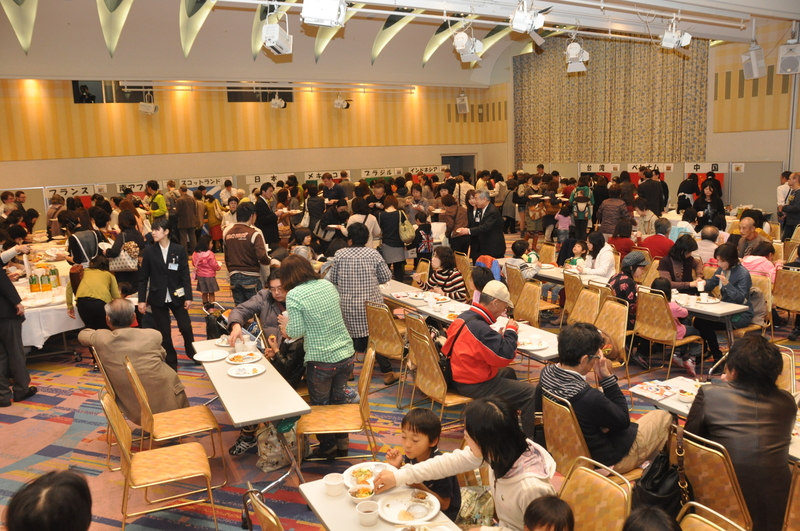 Today I’d like to tell you about the World Festa 2013 held at the Galleria Kameoka on Sunday, March 10th. 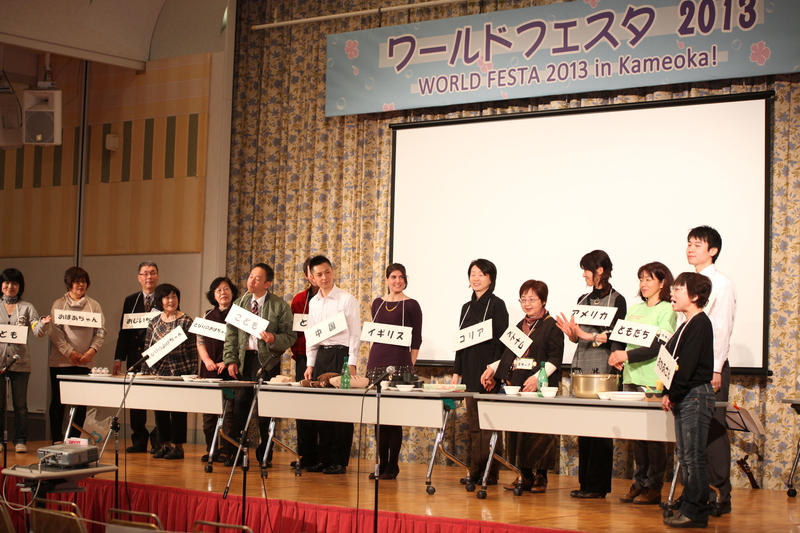 The World Festa is an annual event sponsored by the Kameoka International Exchange Association. However, the event was expanded this year in commemoration of the 30th anniversary of the Kameoka International Exchange Association. 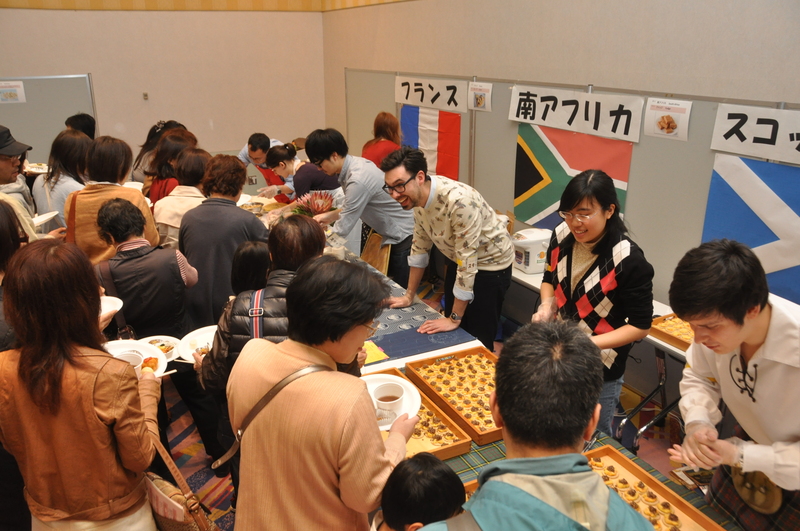 More than 300 people participated in this event, which featured taste testing booths with snacks and simple dishes from 12 different countries, as well as games and other cultural experience booths. We started off the event with an opening ceremony including an introduction of Kameoka’s sister cities and friendship city (Knittelfeld, Austria; Jandira, Brazil; Stillwater, Oklahoma, USA; and Suzhou, China). Each of these cities sent us a congratulatory video letter and photographs that we shared with the members of the audience. This was an exciting new way for us to use technology to bridge the distance between us and our friends in our sister cities and friendship city. Next we introduced the theme of this year’s event—“What is multiculturalism?”—through an original play of the same title written and produced by members of the International Exchange Association planning committee. “Multiculturalism” occurs when people of different ethnicity and nationalities accept one another’s cultural differences and live together on equal terms so that all people can contribute their own personal skills to society. Then we opened the food booths. 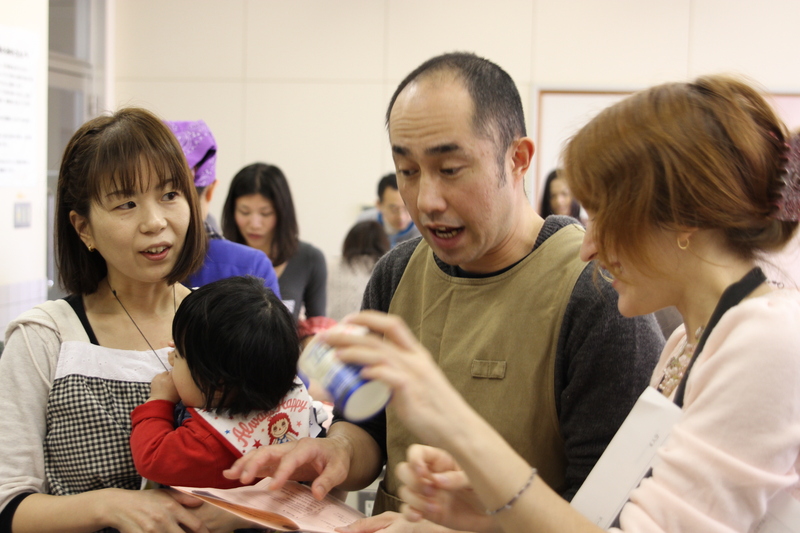 International residents from 12 different countries, including Kyoto Prefecture CIRS Alice Bonamy and Mark Garratt, shared food from their home countries with the participants. 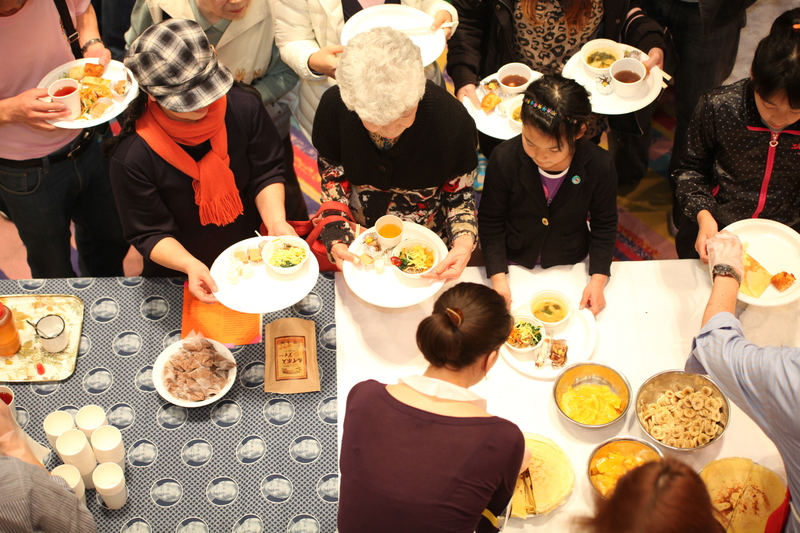 Participants were able to try snacks and simple food from Japan, Korea (Unified Korea), France, Scotland, South Africa, the USA, Mexico, Brazil, China, Taiwan, Indonesia, and Vietnam. After that we had free exchange time, where participants could learn to play games from all over the world, try on traditional clothing from other countries, join an English discussion group, and much more. As a closing, one of our staff members from Brazil took the stage and taught us all how to Samba. At the World Festa, people can not only try foods from all over the world, but also meet people from different countries, and experience other cultures through food, games, and dancing. I believe it is a meaningful event that will help raise awareness about the necessity of creating a multicultural society. 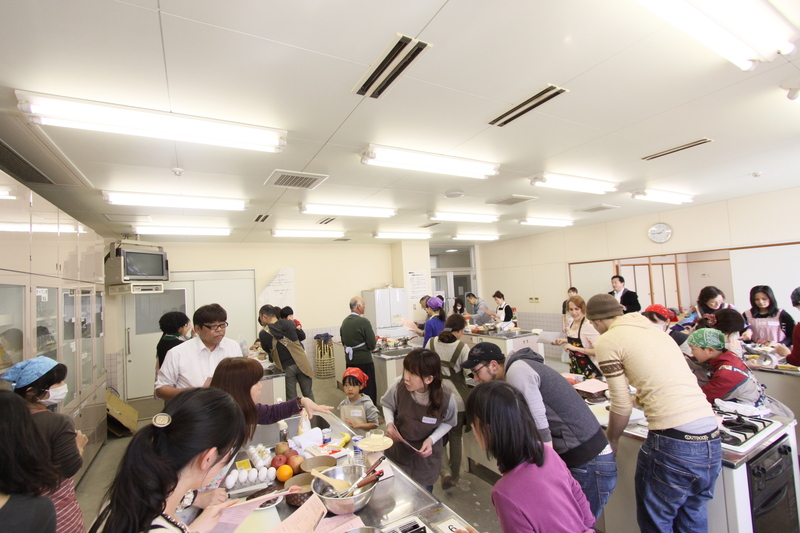 I hope that in the future Kameoka will continue this and other events and work to become a society where all people can live together as equal participants in the community.